12 Judges evaluate 12 Pinot Noirs. All masked, first without food and the scores are tallied. Then the same 12 masked Pinot Noirs are re-evaluated with a course of food. Again the scores are tallied. Note also that the wines are not scored in the traditional sense, but they are rated. 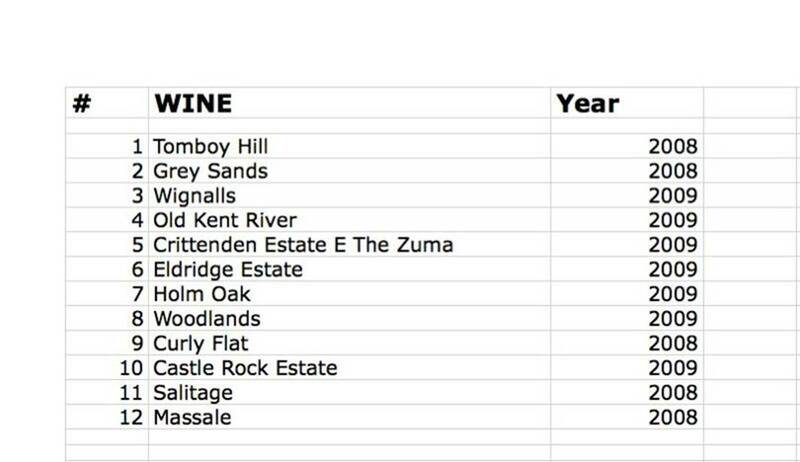 Best wine gets a score of 1 and worst wine gets a score of 12, ergo the wine with the lowest score wins. Most years the winner of the Challenge 'Without' food and the winner 'With' food are different wines, but we did have a couple of years where the winner was the same in both categories. This time, for the first time ever, the first 3 places were exactly the same wines for both Challenges. Unheard of and amazing. This year's Challenge, the 11th so far, was held at Marque Restaurant in Sydney and the food was absolutely superb. If for whatever reason you have not eaten at Marque as yet, or it's a long time ago, you need to go and sample Mark Best's food. Needless to say the service and attention to detail was impeccable. I would like to thank Mark Best and his team for looking after us so brilliantly, all the judges for lending us their palates and time and the Australian Wine Makers for crafting such great wines. The Winners for the first 3 places were the same, in the exact same order, for both categories.